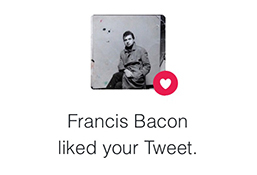 Francis Bacon liked my Tweet! I would be the first to admit that I should tweet more. Every day I’m taking eminently tweetable pictures of interesting people, places and events. One of the main reasons I don’t, is that a lot of my work has a period of client exclusivity/ confidentiality and as a result by the time the client has used the pictures I have often missed the window of opportunity (my other excuse is that I am of course far too busy!). Last week I did have a chance to post a couple of tweets, one of which was a photograph of technicians hanging the Francis Bacon painting ‘Two Figures in a Room’ at The Barber Institute of Fine Arts in Birmingham. I regularly work at the Barber Institute photographing workshops, private views as well as providing press and pr pictures to promote exhibitions in the national and regional press. The Francis Bacon painting is one of the finest of his works in any UK public collection and is on loan to the Barber from The Sainsbury Centre for Visual Arts at the University of East Anglia. It is the first ever Francis Bacon painting to go on display at the Barber. It’s quite a coup for the gallery and as a result I was there to document it’s arrival and hanging. I was quite surprised to find that my tweet had been retweeted and ‘liked’ by none other than Francis Bacon himself (surprised as he died in 1992). 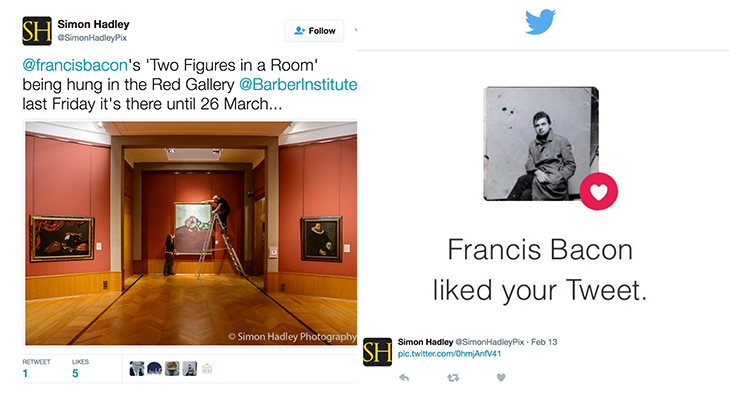 Of course the retweet came from The Estate of Francis Bacon who manage the twitter account..an honour nevertheless!